A long traverse of Belmont Regional Park near Wellington. Hilly farmland, harbour views, explosives magazines, and native forest. Belmont Trig • By HummingBird. Licence: C.
This track is a long traverse of Belmont Regional Park. You can walk it by parking at Petone Station and taking the Hutt Valley Line train north to Manor Park. The regional park entrance is across the highway. Alternatively, skip the northern section of the walk and make a loop to Belmont trig from Petone -- this is the prettier section, being through native forest. Puke Ariki farmland • By Matthew. Licence: cc by-nc-sa. Note: farmed tops sections of this track are closed for lambing August to October. From Belmont Park's Dry Creek entrance, look for the start of the trail next to the information board. The track climbs onto the hillside and up onto scrubby tops, soon coming to farmland. 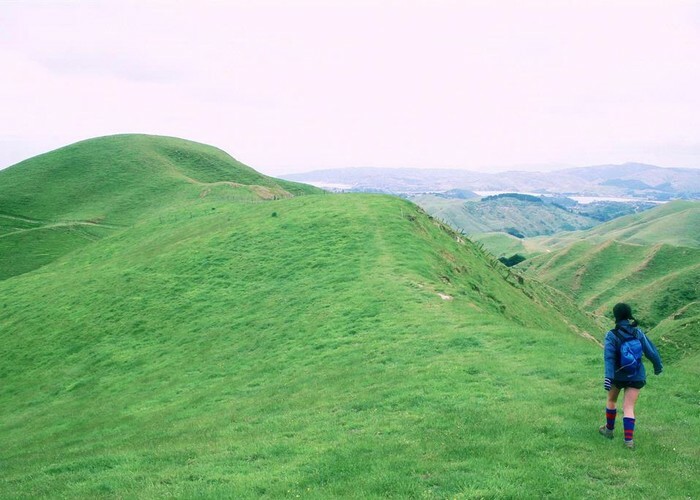 Several different trails are marked on the farmland tops, so watch for orange markers adorned with the "Puke Ariki" trig logo. Eventually, the track crosses a stile and bends left to pass by a series of explosives magazines. This set of 62 concrete buildings was constructed for the World War II Pacific Campaign, and designed to look like a chicken farm when viewed from the air. The buildings only house the bones of dead sheep now. Crossing a rather daring airstrip, the track passes Round Knob then bends left toward Belmont Trig (456m). 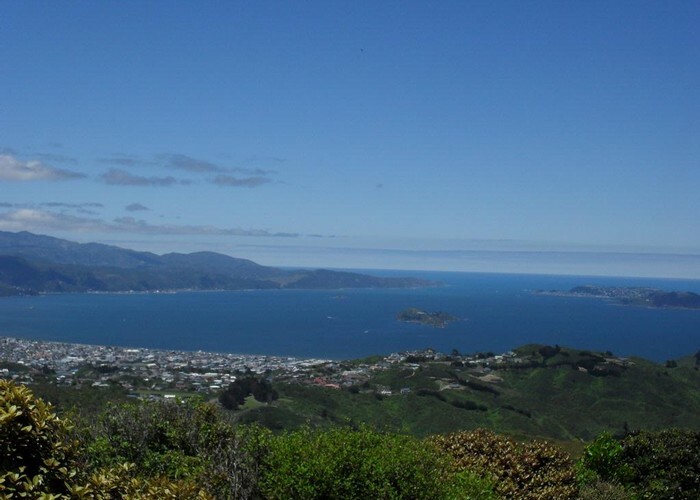 From here, there are excellent views of Wellington Harbour. The descent is through low, wind-sculpted scrub, and down into forest to the pretty picnic spot at Baked Beans Corner (the Bridle Way provides an alternative route for this section). The track drops further to ramble alongside Korokoro Stream, coming out on the industrial Cornish Street, at the back of Petone. Follow Pito-one Road to a footbridge across the railway. Added 31 August 2010 by MatthewMatthew. 1 revision 9 December 2010 by MatthewMatthew. 469 views in the past year (39 per month).